Seder derives from the Hebrew word for order and da Vinci might have gotten the order wrong in the positioning of the figures in his “The Last Supper,” his famous painting of one of the most famous Passover events in history. In the painting you have the iconic picture of Christ at the center surrounded by the Apostles. It’s really white hegemonic male stuff, with the seating plan mirroring the kind of cultural presumptions that deconstructionists like to detoxify. 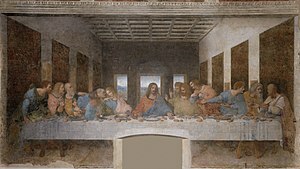 In an essay entitled "The Seating Plan at the Last Supper," (Community in Mission, 4/4/12) Monsignor Charles Pope takes issue with da Vinci’s imagination of the event making the point that historically such celebrations occurred around a U shaped table in which Christ might be sitting top left, and say Peter diagonally to the right at the base of the letter. Human beings have comfort zones, but one of the purposes of a spiritual holiday is to challenge the kinds of assumptions that are held closely to the chest. The Red Sea parted and the Jews made their way to the Holy Land, but they had no idea where they were going to be seated and that in a sense is sending one of the holidays many messages. Get out of your comfort zone. Sit in the part of the restaurant you have never found cozy or inviting. If you’re a big cheese don’t seat yourself center stage, but off to the side where you can engage someone you haven’t talked to before.